We’re not sure what this was supposed to be, exactly. There’s no there there. Death Squad is a movie that runs solely on the charisma of the actors involved, and nothing else. If it didn’t have Hauer, Hannah, Madsen, and Baldwin, and had a bunch of no-name actors running around in the dark on the one set they had, it would have been complete torture to watch (AKA Albert Pyun-level). As it stands, there are moments that you think just may be entertaining enough to be stupid. Either that, or moments that are stupid enough to be entertaining. We’re still not sure which. Whenever Madsen is on screen, he livens things up. He has a cool coat and even his own theme music. This time, his attitude of not caring is entirely justified. The audience can relate. Rutger Hauer spits out some nonsensical dialogue and seems confused. 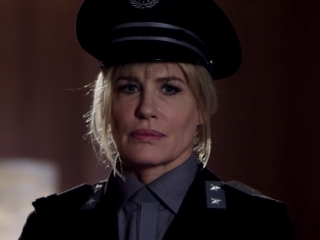 Daryl Hannah is there as one of the Nazi-esque soldiers, and Baldwin was clearly recalling his role as Weed in the classic Dead Weekend (1995). Danny Glover does what we call a ‘sit-down’ role, though we think he stands up briefly at one point. There’s even what we call the PT (Prerequisite Torture), but this time it’s PTT - the Prerequisite Torture of Tuag. All of this should have hit video stores somewhere between 1998 and 2003. Yet, inexplicably, it came out in 2014. Audiences should demand to know why. While, yes, the movie has no structure, it’s filmed on what appears to be one set, in the dark, actors look at computerized screens and say nonsensical things for 80 minutes, and it’s all doubtlessly stupid, it’s still better than April Rain (2014). That’s the tricky thing about watching - and reviewing - movies. Whether you realize it or not, it’s all about context. If you watch April Rain, then just about anything else, the movie you watch after that is going to seem good - perhaps better than you’d normally think it would be. Your experience is colored by subconscious comparison. 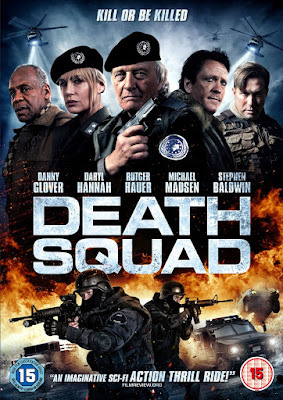 If we had watched something really awesome beforehand, we might be tougher on Death Squad, but because we watched April Rain the day before, we were in a really forgiving mood. All that being said, it still tested our patience to the limit and we came away unhappy. Dang. Thanks for the heads up! I've been eyeing this one forever now. Keeps popping up on Netflix and Hulu Plus. LOL. I was mainly curious because of the cast. We were too, the cast got us sucked in, but it was a weak, confusing and downright silly movie. Except for Madsen's character. Some people like Baldwin and especially Glover don't pull their weight like you might think.